Just before Halloween in 2009, Canon announced its most powerful DSLR to date. The $5,000 professional-grade EOS-1D Mark IV was the company's answer to Nikon's market-leading D3S, which rang in just shy of $5,200. On the basis of price alone, Canon won that round. Then, after two years of silence, the company launched its new flagship, the 1D X. The date was October 18th, 2011 -- roughly 10 (or "X") years after the very first model in the series was announced, way back in 2001. A decade ago, Canon priced that introductory 1D at $5,500 -- a princely sum considering the 4.15-megapixel CCD on board. Now, the 1D X, which is arguably the most powerful sub-five-figure camera available, commands 6,799 of your hard-earned dollars, or $800 more than the D4, Nikon's $6,000 equivalent. All this talk of price may seem to skirt the camera's long list of lust-worthy features, but when the cost of any piece of hardware approaches a year's tuition at a public university, a purchase decision deserves thorough consideration. A camera in this league is absolutely to be used as a professional tool. And while deep-pocketed amateurs may pick one up -- in the way folks with cash to burn may build a collection of overpowered two-seaters -- the vast majority will live in $30,000-plus kits, where they'll reach six-figure shutter counts, and will likely change hands several times before their eventual retirement. 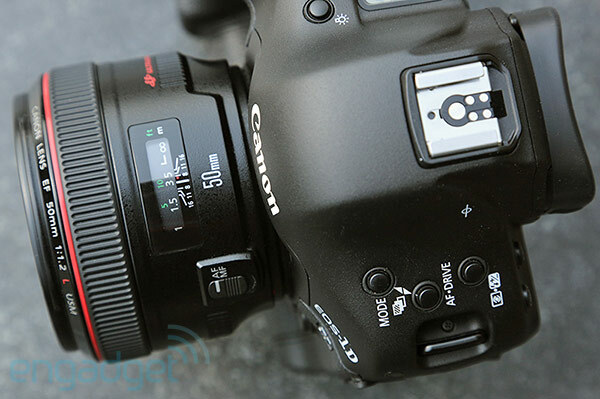 Right now, you're probably researching the 1D X as exhaustively as you would a new car -- in fact, you may have even lined up a test drive, through the company's Canon Professional Services group. Many months after it was first announced, we've had an opportunity to take the new eXtreme model for a spin ourselves, and it's every bit as impressive as its price tag suggests. Canon's top model isn't any smaller or lighter than its predecessors, the 1D Mark IV or 1Ds Mark III -- but is all that bulk justified, despite strong contenders like the workhorse 5D? Buckle up and join us in the field (ahem, after the break) to find out. Canon doesn't need to budget any precious advertising funds to spread word about the 1D. The company's flagship model is one of the most photographed DSLRs on the planet, though like the shooters that stand behind it, this camera spends much of its time in the background. Perhaps you caught some of the World Series, or the Super Bowl, or maybe the Olympics earlier this month -- behind each of those enormous white "paparazzi" lenses, there was likely a Canon 1D. The camera's design has become iconic, symbolizing professionalism, quality and power. To the untrained eye and with a bit of gaffer tape atop the prominent silver X, this 1D would look like any other -- superficially, the design hasn't evolved all that much in a decade, though button placement has shifted as controls have been added. And, since it hasn't changed a lick since our first demo last year, we're including that accurate account above. Like other full-size DSLRs, this model is designed to provide a natural feel in portrait mode (positioned vertically), should you find yourself in a studio setting or alongside a red carpet. 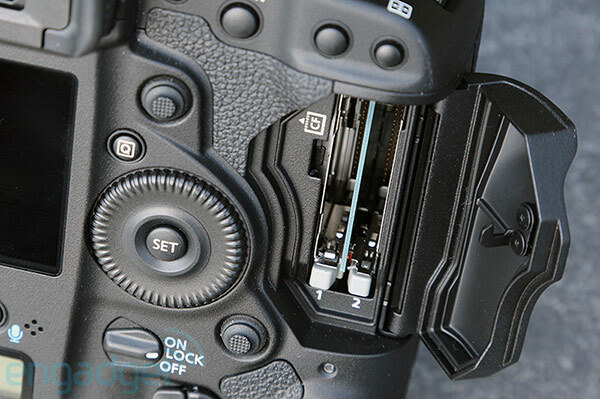 Key controls like the AF-ON button, exposure lock and focus position all enable easy toggling regardless of your orientation, while secondary shutter release and exposure dials provide direct access in both positions as well. 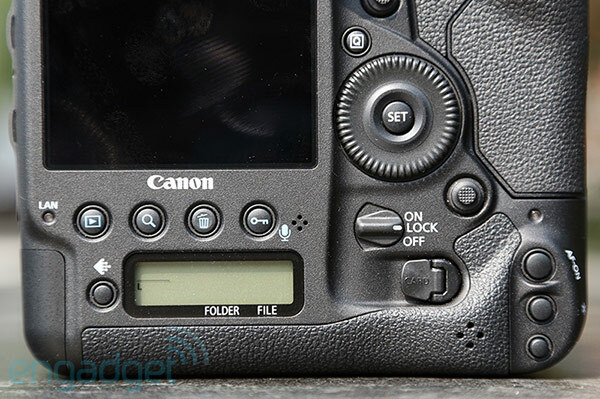 Dual CF card slots tucked behind a textured plastic door let you duplicate your captures (with identical cards) or boost capacity, while the large secondary control wheel to the left of the storage compartment hasn't changed a bit over the years. Also identical is the battery design, which provides for easy access while also enabling a secure fit, letting you swap 2,450mAh LP-E4N packs. Up top, you won't find a flash or even a focus-assist lamp, but instead you'll see Canon's signature raised pentaprism, with a hot shoe atop, which you can use to accommodate a Speedlite flash, or perhaps even one of those nifty floral silver covers. One of the X's most notable strengths is its ability to be customized to your liking. Obviously you can't reconfigure the physical button placement, but you can adjust the settings that they control, re-assigning access so that it's consistent with your previous 1D bodies. Photographers are likely to miss their shot if even a split second is spent looking away from the viewfinder to dig through menus, so a familiar layout is key. If you've used other 1D cameras, you should be able to blindly find your way, just as typing on a QWERTY keyboard becomes second nature over time. The menu system and organization should be familiar as well, with a total of 24 different configuration screens -- options range from color space to in-camera RAW image processing. Custom settings let you adjust exposure level or ISO speed increments, limit the continuous shooting speed (the camera tops out at a very impressive 12 fps) or adjust dial directions -- among many, many other options. The menu structure itself is nearly identical to that in the 5D Mark III, letting you use that body as a backup or second shooter while maintaining the same configuration on both cameras. The 1D X offers your typical array of shooting modes, including full manual, aperture- and shutter-priority, program and a custom program mode. There are also several drive options, such as single shot, low-speed continuous at three frames per second, high-speed continuous at a whopping 12 frames per second, two time-delay options and a "silent" mode, which is by far the quietest option (compared to the rapid-fire machine gun-like spattering you'll get with 12 fps). 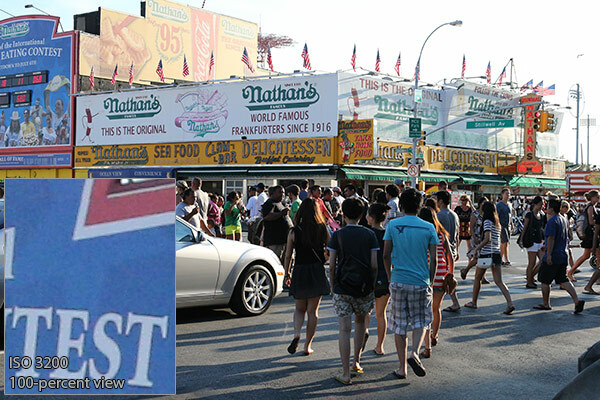 If you're going for discretion, however, you'll want to use the 5D instead. As for that 12 frames-per-second mode, we were able to capture 70 consecutive frames with a SanDisk Extreme Pro CF card before noticing any slowdown -- assuming you're able to focus, there's really no excuse for missing the shot. Captures looked fantastic, as we'll discuss a bit further down, but you can't snap sharp images in low light if you're not able to focus. A bit surprisingly, we had tremendous difficulty with autofocus in dim settings when paired with a 50mm f/1.2 L lens -- environments where we couldn't see very well ourselves, but the 1D X still managed to capture clear, bright images, once it did locate a focal point. Selecting a brighter object at a similar distance allowed us to pre-focus then adjust framing, but if you're shooting in dim light you're probably going to want to add a Speedlite, many of which offer that annoying flash of red light that's admittedly critical in these situations. Unfortunately, there's no focus-assist light built in. In every other lighting scenario (generally situations where we were able to make out details clearly with the naked eye), the camera's focusing system performed flawlessly, adjusting accurately and with little effort. The 12 frames-per-second shooting mode is certainly useful, but only if you have a focusing system that can keep up. Unfortunately we didn't have an opportunity to test the 1D X at any sporting events, which would have provided the necessary venue to really push the DSLR to its limits, but we were quite pleased during a day-long shoot on the streets of New York City. Whether you're embedded with the military in an active war zone or on the sidelines during a championship game, the last thing you want to worry about while on assignment is swapping batteries, and you should be in very good shape here. We didn't continue shooting until the battery was depleted during our week-long trial, if only because it seemed an impossible task. After more than 2,000 images and several hours of digging through menus and reviewing photos on the built-in LCD, we still had 41 percent remaining according to the system menu. Performance will of course vary depending on external conditions (such as weather) and how much time you send "chimping" (the practice of reviewing images on the LCD after each capture), but you'll likely be quite pleased. You'd expect Canon to be at the top of its game when it comes to image quality with the 1D X, so we weren't surprised to see that performance was spot on. The images you'll see below and in our gallery are JPEGs captured at the highest possible quality setting (10/10) with high-ISO noise reduction turned off. Let's take a look. Shoot from a moving cab in the middle of the night? You bet. This 50mm shot was captured at f/2.2 and 1/125 second at ISO 51,200 as we sped through an intersection. The camera focused and captured details, including the text on an easel, without issue. Let's head to the beach. Now don't be fooled by the sky -- this f/2.8, 1/16 second frame was shot well after sunset (notice the bright lights of nearby Coney Island in the far right). 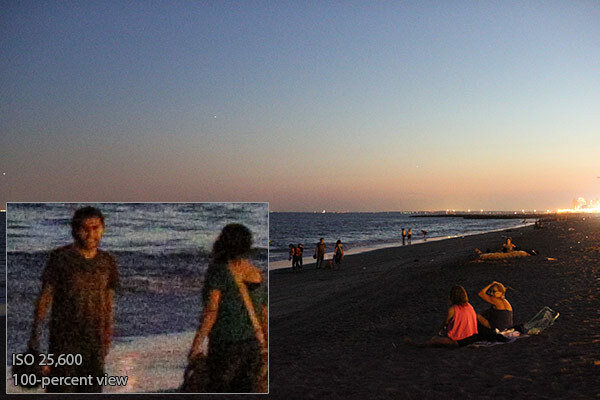 Still, you can make out plenty of detail with barely visible noise when viewing the full frame at 600 pixels wide. 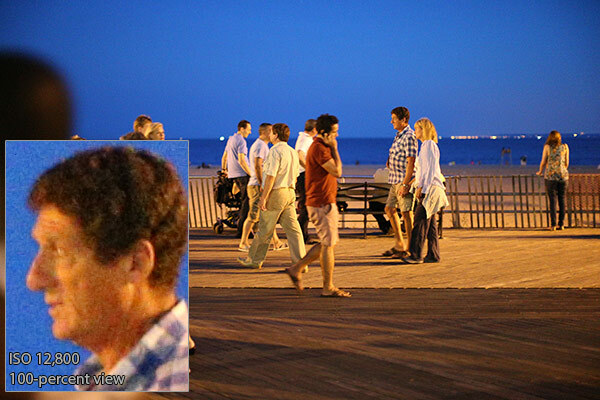 And what about the view from the boardwalk? Crystal clear, and colorful, even -- the typically harsh streetlamps mixed nicely with the night sky to yield this scene. We opened the aperture all the way up to f/1.2 in order to stop motion with a 1/64 second shutter speed, without venturing beyond a 12,800 ISO. Let's jump back a few hours and catch some of that evening light. Shooting at ISO 3,200 (our typical default, given the 1D X's capabilities), noise was invisible until you jumped all the way up to a 100 percent view (see inset). We froze the action in this busy scene at f/11 with a 1/2000 second exposure. 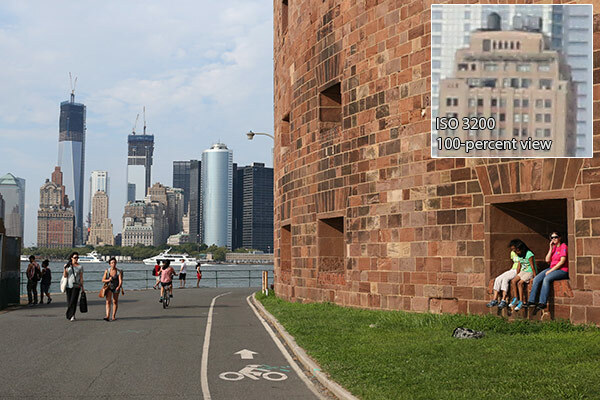 We hopped a ferry to Governors Island to catch some of the best views of Lower Manhattan, including the new World Trade Center site. Bright daylight enabled a 1/4000 second exposure at f/14 with an ISO of 3,200, yielding sharp details in the foreground, and of buildings many blocks away. You surely don't need to shoot at ISO 320, ever, though that's exactly what we did here. 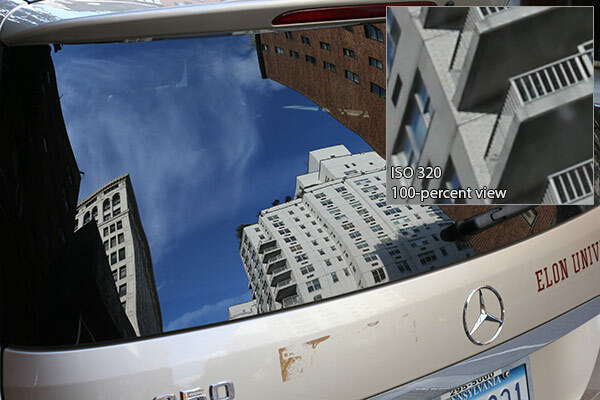 There's no noise as a result, and any softness you may notice was likely caused by the distance between the car and the buildings reflected in the windshield. We captured this last image at f/13 with a 1/50 second shutter speed. 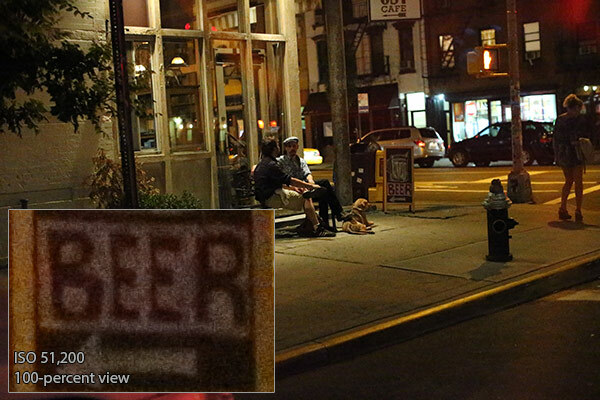 We can't litter this review with dozens of samples, but there's plenty more to see in our gallery. Click through the thumbnails above for larger scaled versions of the shots we have here, along with plenty more examples, captured in a variety of lighting scenarios. If you're a 1D Mark IV owner in the market for a new professional DSLR, you probably already know you're buying the X. 1Ds Mark III shooters who spend most of their time in a studio may have less motivation to jump, however, considering the current street value of that camera and the benefits of the X when shooting in controlled lighting environments. If you don't own either camera now, but instead have a thick wad of cash burning a hole in your wallet, we can't imagine you'll be unhappy with the X -- just keep in mind its massive size, and figure how that may fit into your lifestyle. Canon's 5D Mark III is also a fantastic full-frame camera, and may ultimately be the better pick, unless you plan to snap away from your court seats at the Lakers game. If pure power is what you're after, and you need to have the absolute best, you'll want to get behind Canon's latest beast -- it doesn't get much more eXtreme than this. What's a field review, you ask? Essentially, the term serves to clarify that our analysis is based on real-world usage, which regrettably doesn't include the thorough benchmarking a camera of this caliber ordinarily requires. It's a perfectly suitable assessment by a photographer that's spent many hours operating similar equipment, but given the cost and sophistication of a camera like this, we would recommend that professionals also consider reviews from other sources before making a purchase.